Industrial roller machine cutting paper. 4K. Engraved copper plate in the dark warm. A light in the dark discovering an engraved copper plate with the drawing of an inn. Warm lighting. 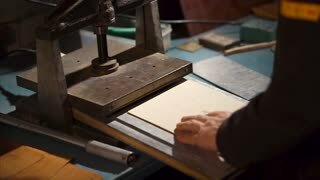 A letterpress printer feeding paper through his press which is being embossed onto a card. This is a stamping process for producing raised or sunken designs. The modern production process of textiles in the 1940s. Traditional Tinsmith Work. Copper Smith Makes Embossing Artifacts From Copper.